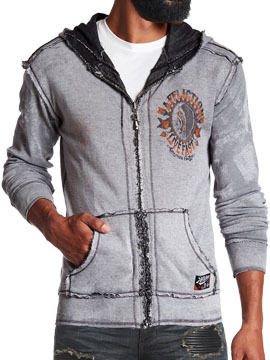 Affliction ACMC Stampede reversible men's long sleeve zip front hoodie features two great designs in one jacket. The white side front features the Affliction Live Fast emblem with a Native American Indian skull and headdress in the center, the back features a large hand drawn image of a Native American inspired Indian skull wearing a headdress with the Affliction American Customs logo above and below. The black side front features a celtic inspired upside down fleur-de-lis in the center on the front. The back features a larger medieval and celtic angel wings with a upside down fleur-de-lis emblem in the center with the Affliction Live Fast logo above and below. 100% cotton, custom fleur zipper pull, light weight, slim fit. Garment dyed with silicon wash for soft feel. Color: white and black.